Welcome to Episode 149 of SunCast! Today’s Guest doesn’t consider herself an entrepreneur, but after listening in I’m sure you’ll agree most corporate leaders and startup founders alike can learn a lot from Bernadette del Chiaro. Her accolades are many, and we discuss them in the episode, but I thought it would be great to round out this Women’s History Month with someone who has made an indelible mark on the solar and energy sector through her advocacy and political organizing. Bernadette has been a leading voice in California clean energy & climate advocacy for 2 decades. Now, as the Executive Director of the California Solar and Storage Association, she is directly responsible for providing a voice and platform for over 500 member solar companies. 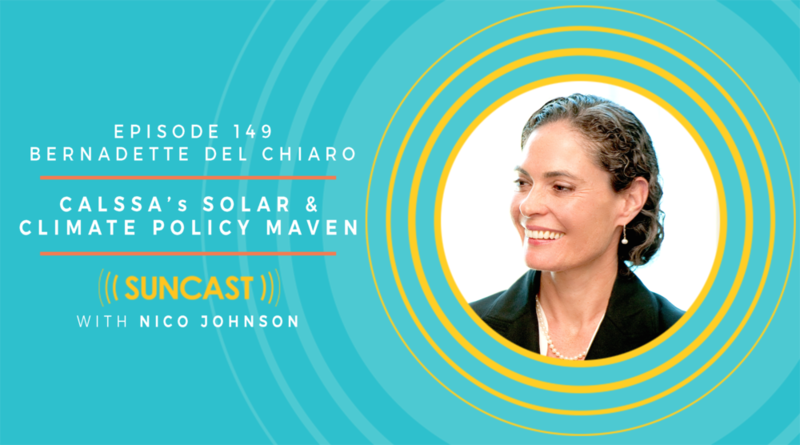 Hear how she helped create the California legislative initiatives we now credit as a huge impetus to the current solar boom in the US! She’s now instrumental in driving forward energy storage initiatives like SB700, dubbed the Million Solar Roofs of Energy Storage. We dig into these and more, including Bernadette’s advice on how You can be more active in lobbying and policy right where you live. Also, next week we’ll hit episode 150! Woot! I’ve got an amazing guest lined up, Mr. Henk Rogers, who is the founder of Tetris, Inc, yes, the popular game you no doubt have spent hours playing. He also has an energy storage startup, and it’s a fascinating story, so stay tuned. Remember you can always find me onTwitter,LinkedIn oremail and you can get the resources and learn more about how to find Rick or his recommendations on theSunCast Blog. The Million Solar Roofs of Energy Storage Passed California Assembly!